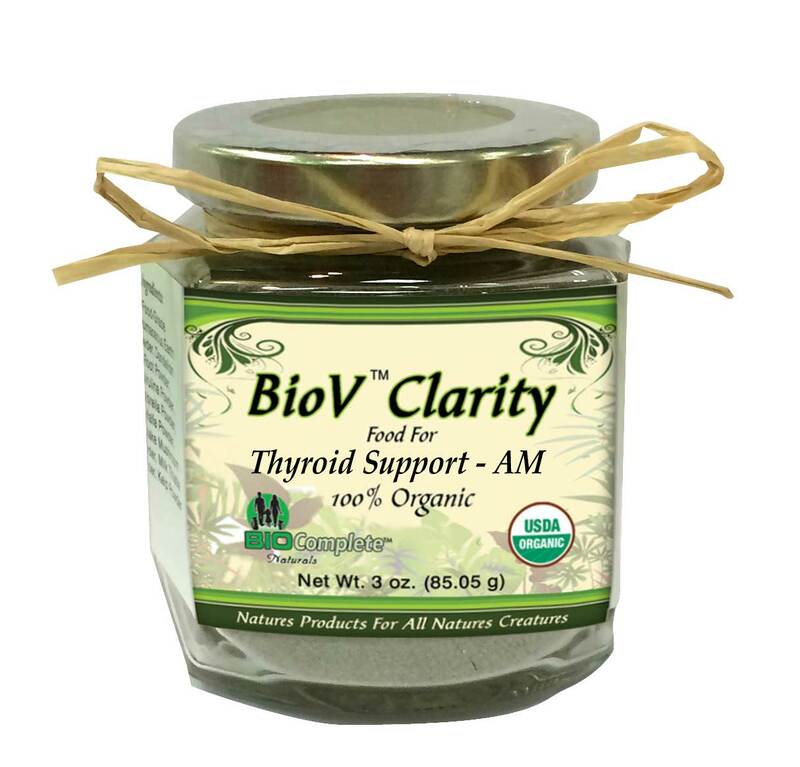 BioV™ Clarity Thyroid Support AM Blend - Thyroid issues are a major health challenge in us and our pets. As the result of spay and neutering in our pets, thyroid issues are almost guaranteed. Missing body components due to surgery, sterilization or other medical conditions tax the thyroid gland to the point of an imbalance. Helps strengthen this and other body organs through our 2-part synergistic approach packed with hormone supporting Bio-available minerals. Our proprietary blend of botanical foods is formulated with natural thyroid and endocrine supportive foods that support a wide range of health challenges including healing. Use in a synergistic partnership with BioV™ Clarity Thyroid PM Blend. Ingredients - A proprietary blend of: Irish Moss, Spirulina, Nettle, Miatake or Shiitake, Echinacea, Milk Thistle, Club Moss, Maca, Ginger, Ginseng, Turmeric, Dulse, Tulsi, Pau d’Arco and Diatomaceous Earth Powder (food grade).